This two-man submarine ran aground at Guam's Togcha Beach in mid-August 1944 while on a mission to attack American shore facilities. The battle for Guam had ended more than a week before. Although Japan built more than 2,000 midget submarines between 1934 and 1945 and deployed them throughout the Pacific, these subs were credited with sinking only one ship during all of World War II. It is unclear why the sign says that the submarine had a crew of two, since a Type C Kōhyōteki midget submarine had a crew of three (Delgado et al. 2016, 92; Warner and Seno 1986, 173). A guidebook published by the War in the Pacific National Historical Park indicates that the National Park Service conducted extensive restoration work on the midget submarine in 2009-10 to give visitors a better idea of what it looked like in 1944 when it ran aground. 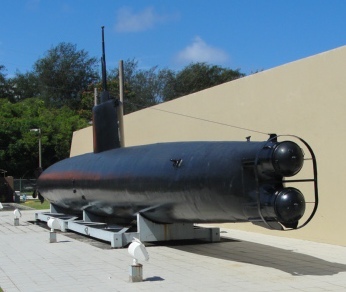 In 2000, the midget submarine was listed in the National Register of Historic Places. Delgado et al. (2016, 100) writes about the crew of the midget submarine that ran aground, "Reportedly, three days after the discovery of the craft, the three crew members surrendered to US forces from their hiding place near the beach, but the account may be apocryphal." Tokkōtai Senbotsusha (1990, 222-3) mentions only the loss of 14 midget submarine crewmen at Saipan (120 miles north of Guam) and Tinian (about 5 miles from Saipan) during July 1944 and no losses in the area in August. The Japanese Tokkōtai (Special Attack Forces) Commemoration Peace Memorial Association recognizes deaths by midget submarine crewmen as deaths by special (suicide) attack even though the causes of many deaths are difficult to differentiate between special attacks and other reasons (Tokkōtai Senbotsusha 1990, 220). 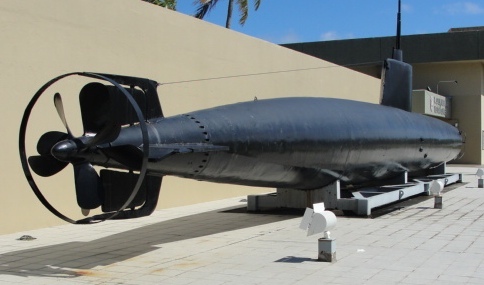 The most famous midget submarine attacks were at Pearl Harbor, Sydney Harbor, and Diégo Suarez Harbor in Madagascar. A total of 440 midget submarine crewmen died during the Pacific War (Tokkōtai Senbotsusha 1990, 220-35) . 1. The Ōurasaki Special Attack Base (P Base) Monument gives the total number of midget submarine crewmen deaths during the Pacific War as 439, and the Tokkōtai Commemoration Peace Memorial Association plaque in front of Yasukuni Jinja Yushukan shows 436. Delgado, James P., Terry Kerby, Hans K. Van Tilburg, Steven Price, Ole Varmer, Maximilian D. Cremer, and Russell Matthews. 2016. The Lost Submarines of Pearl Harbor: The Rediscovery and Archaeology of Japan's Top-Secret Midget Submarines of World War II. College Station, TX: Texas A&M University Press. Warner, Peggy, and Sadao Seno. 1986. The Coffin Boats: Japanese Midget Submarine Operations in the Second World War. London: Leo Cooper in association with Secker & Warburg.